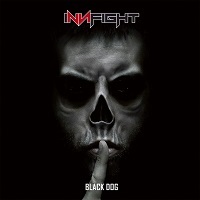 Mannheim, Germany, based Hard Rock outfit INNFIGHT present their second offering “Black Dog” after their debut album “Boulevard of Pain” dropped in 2015. The band, formed in 2013, went through their share of line-up changes and has more-or-less settled on their current formation. The band has said that the name of the outfit came about when they scrutinized their songs and realized that it was very personal to them. The name is a derivative from the “inner” fights that they have had to endure. The music that the band has created has been influenced by a wide range of acts from LINKIN PARK to AC/DC. The band went through a tough time when bassist Thomas Klesius died due to a serious illness. Nevertheless, they persevered and with the help of Tommy Schmitt, they managed to complete the recording of the album. The album has a running time of just over 48 minutes and has 11 modern energetic Rock songs. Most songs hover around the 4-minute mark which is the perfect Rock song length. The album kicks off with “Not Me”, a melodic Rock song. The track starts off with an angry riff and the song continues on its aggressive path for its entire length. The title track “Black Dog” has an electronic inspired start and the song boasts of one of the best leads on the album. “Get up” is another good example of a modern Rock song and has a memorable chorus. “Shame” starts off with a simple riff that builds on the excitement the riff generates and explodes when the vocals join the party. “Bright Lights” is an abrasive track that rounds up the album quite nicely. The band has put out an album with good songs that will thrill the Rock fans. There are definite pockets in the track when the band has sounded a tad progressive. The songs are melodic and modern with parts that are straight up Hard Rock. There is also a hint of influences from American bands like ALTER BRIDGE or STONE SOUR and NICKELBACK. The tracks are mature and the vocals are a revelation. However, I felt that the album was very generic in nature. No doubt the songs are strong and well-constructed, one feels that it doesn’t really stand-out. The production value is good and the songs are compelling. These days, recording an album is not very cumbersome as it was even decades ago which has prompted many bands to spring up. The only way to remain relevant is to be original. This is what I expect this band’s next album to be. All in all, this is a solid album, with good musicianship and some killer riffs and lead guitar sections. A must-have for Melodic/ Hard Rock fans.